DC Safe Rail | Don't Be Railroaded! Ward 6 has the lowest tree canopy (17%) in the city. CSX has already started removing 191 trees from public lands in Ward 6, even though there’s a rapidly-advancing legal challenge underway by the Committee of 100 on the Federal City. All other trees on CSX property, number unknown. Now: wood chips. 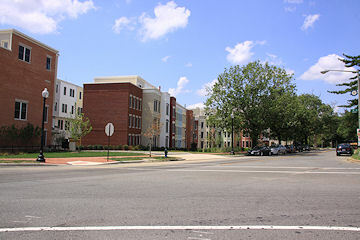 when the city renovated the building in these pictures, 200 I St., they removed exactly one tree. They recognized how significant the tree was and they used the wood in the floor of a conference room in the building. No such respect from CSX. The CSX tree removal fee of $133,100 averages $697 per public tree. Mature trees removed from public lands will eventually be replaced with saplings. There are 404 trees within the project’s Limits of Disturbance (LOD). Even trees that are not removed could weaken or die because of years of relentless construction, sometimes only a few feet away. The environmental (NEPA) review did not analyze the cumulative loss of so many trees within such a concentrated geographic area. The Capitol Hill Restoration Society said that many trees may not be replaceable in their current location because the wider, higher, shifted tunnels would interfere with their root systems. Tell them to stop construction while the CSX expansion receives proper legal review. And tell them to demand a new, fair, transparent environmental review. The last one was decided in secret before it even began. DC wants shade, not shady deals! Cutting down a beautiful tree south of Virginia Avenue. DC Wants Shade, Not C$X Shady Deals! WHY IS CSX CUTTING DOWN MATURE DC TREES WHILE A LEGAL CHALLENGE IS PENDING? CSX will remove DC trees as early as May 18. Ward 6 has the lowest tree canopy cover in DC (only 17%), and summer heat and pollution is on the way. These are the only mature trees in our part of the city, and once they’re gone, they’re gone forever. CSX should not be allowed to take these trees down – causing irreparable harm to our community – while there’s a legal challenge underway. CSX wants construction as far along as possible before its recently-discovered nefarious dealings are subject to legal, media, political, and public review. IS THE CSX EXPANSION LEGAL? The Committee of 100 on the Federal City (C100), DC’s foremost citizen planning group, is suing to stop work on the Virginia Avenue Tunnel expansion. The C100 has filed compelling evidence that the expansion was given an illegal green light by the DC government before going through the environmental review required by the National Environmental Policy Act (NEPA). It also appears that the District Department of Transportation (DDOT) and CSX engaged in “pay to play,” with millions suspiciously changing hands. The recently-produced 130,000+ page administrative record for the case reveals extensive behind-the-scenes negotiations in which DDOT and other executive branch officials dangled NEPA approval as an incentive for lucrative bargains with CSX. As one example, on January 20, 2010, DDOT’s head of Policy and Planning advised DDOT Director Gabe Klein that DDOT should determine “what leverage we have with the Virginia Avenue tunnel… and how we can use that [against CSX] for other acquisitions.” DDOT presented its wish list, and a slew of secret agreements ensued. CSX also made a 2012 “donation” to DC, the amount and terms of which are still unknown. You shouldn’t get to tear up a neighborhood if you haven’t followed the rules. PLEASE HELP SAVE OUR TREES AND NEIGHBORHOOD! CONTACT MAYOR BOWSER & COUNCILMEMBER ALLEN. Tell them to put construction on hold while these backroom deals receive proper legal and other review. CSX is rushing to maximize its corporate profits and secure the benefit of its shady deals. Fair process, and the safety and security of residents and the nation’s capital, are paramount. Even the NEPA documents say that the tunnel will be safe for decades. If those are wrong, CSX should cease hazmat shipments through the tunnel immediately. The Committee of 100 on the Federal City continues its pursuit of a court order that would effectively stop the CSX tunnel expansion project under Virginia Avenue SE, in Washington, D.C. The Committee has appealed the District Court’s denial of a Preliminary Injunction to the US Court of Appeals for the D.C. Circuit. The appeal includes an Emergency Motion to reverse the District Court’s decision and suspend the effectiveness of the Environmental Impact Statement, thereby preventing construction of CSX’s Virginia Avenue Tunnel until the Court can issue a decision on the merits of the case. The appeal argues that the District Court applied an overly strict standard to the Committee’s claim that the outcome of the National Environmental Policy Act process was determined before the environmental analysis was concluded. The Court’s predetermination standard would permit an agency to enter into agreements and accept all manner of valuable inducements that lock it into a course of action. If allowed to stand, the District Court’s decision would erode the integrity of the NEPA process because it seriously undermines the “hard look” required by the National Environmental Policy Act and implementing regulations. Neither the District Court nor the Committee of 100 had access to the full record in the case, which consisted of over 130,000 pages, until April 23, 2015. The record contains persuasive evidence of improper predetermination that was not available to the District Court when it denied the Committee of 100’s Motion for a Preliminary Motion on April 7, 2015. In its appeal, The Committee of 100 has now brought those improprieties to the attention of the Court of Appeals and is also seeking reconsideration from the District Court. A pdf of the Emergency Motion is enclosed with this press release. In the three-part I-Team series that aired on January 7th and 8th, NBC4 Investigative Reporter Tisha Thompson highlighted the huge blast and evacuation zone for hazardous cargo that CSX routinely carries through the District. The evacuation zone is a mile-wide for materials – including molten sulfur, ammonium nitrate, and molten phenol – that the I-Team spotted on CSX trains traveling through the city’s monument core. That evacuation zone includes the U.S. Capitol, numerous federal buildings, national landmarks on the Mall, 395, 295, and 10 metro stations. Hazardous materials will travel through the District in much greater quantities, and at higher speeds, if CSX is allowed to build new twin tunnels in southeast. The I-Team also found a murky money trail between CSX and the District Department of Transportation. DDOT refused to explain inconsistencies in the documents that it provided in response to the I-Team’s Freedom of Information Act Request. That prompted Council Chairman Phil Mendelson to recall DDOT’s “gag order” restricting witnesses at Council hearings about the CSX expansion. Chairman Mendelson told Thompson that these chemicals shouldn’t move through the city at all. “It does not have to come through here,” he said. “It’s not that complicated. Just reroute that hazardous material which has an evacuation area that includes the Capitol.” The Council is trying to reduce risks through rail safety legislation introduced on January 6 by Councilmembers Mary Cheh (who chairs the transportation committee), Charles Allen (whose Ward 6 includes the CSX tunnel), and David Grosso (at-large). The Council is also preparing a District Rail Plan. The Committee of 100 on the Federal City has sued to stop the CSX expansion, saying that the environmental review process and the hidden grant of new right of way to CSX violated federal and city law. The lawsuit will examine DDOT’s pre-approval of the expansion, before the environmental review had even begun, and the exchanges of money between CSX and DDOT. On February 17, the court will hear arguments about the C100’s motion for a preliminary injunction to halt permits and construction for the CSX twin tunnels pending the final outcome of the litigation. WRC TV, NBC Channel 4 in Washington DC, sent their award-winning investigative reporting team to explore the risks and coverups surrounding CSX’s plans to expand the Virginia Avenue Tunnel and freight rail capacity in Washington DC. Did shady backroom deals happen between CSX and DDOT? Why aren’t DDOT and CSX answering the DC Council’s questions? Exactly which toxic and explosive materials is CSX already transporting through Capitol Hill? If DC were to have a CSX derailment (like that which occurred last year in Lynchburg, VA), what would be the potential blast zone? Is your home or workplace at risk? What they discovered should make every DC resident and worker demand the VA Avenue Tunnel project be stopped until the DC Council’s fully-funded Rail Plan is completed and a Safety Office implemented to protect the people and institutions of our nation’s capital. DC residents are demanding safety and transparency from CSX and other railways for reasons that are becoming more and more obvious, as this article makes clear: “Trains Plus Crude Oil Equal Trouble Along the Tracks.” Freight rail along the monument core, a densely packed urban neighborhood, and a few blocks from the US Capitol and the treasures of the Library of Congress? That poses a real risk that should make DC and federal officials think twice. TUSCALOOSA, Ala. — Every day, strings of black tank cars filled with crude oil roll slowly across a long wooden railroad bridge over the Black Warrior River. The 116-year-old bridge is a landmark in this city of 95,000 people, home to the University of Alabama. Residents have proposed and gotten married next to the bridge. Children play under it. During Alabama football season, Crimson Tide fans set up camp in its shadow. But with some timber pilings so badly rotted that you can stick your hand through them, and a combination of plywood, concrete and plastic pipe employed to patch up others, the bridge shows the limited ability of government and industry to manage the hidden risks of a sudden shift in energy production. And it shows why communities nationwide are in danger. On April 30, 2014, a CSX train carrying Bakken crude oil derailed in downtown Lynchburg, Va. No one was injured or killed but three tank cars went into the James River, spilling 30,000 gallons of oil and igniting a fire.”It may not happen today or tomorrow, but one day a town or a city is going to get wiped out,” said Larry Mann, one of the foremost authorities on rail safety, who, as a legislative aide on Capitol Hill in 1970, was the principal author of the Federal Railroad Safety Act. Almost overnight in 2010, trains began crisscrossing the country carrying an energy bounty that includes millions of gallons of crude oil and ethanol. Tens of thousands of tank cars and a 140,000-mile network of rail lines emerged as a practically way to move these commodities. But few thought to step back and take a hard look at the industry’s readiness for the job. Government and industry are playing catch-up with long-overdue safety improvements, like redesigning tank cars and rebuilding tracks and bridges. Those efforts in the past year and a half may have saved lives and property in many communities. But they came too late for Lac-Megantic, Quebec, a lakeside resort town just across the Canadian border from Maine. A train derailment there on July 6, 2013, unleashed a torrent of burning crude oil into the town’s center. Forty-seven people were killed. “Sometimes it takes a disaster to get elected officials and agencies to address problems that were out there,” said Rep. Michael Michaud, D-Maine, a member of the House subcommittee that oversees railroads, pipelines and hazardous materials. © Curtis Tate/McClatchy DC/TNS Decaying track and bridge conditions on the Alabama southern railroad could pose a risk to Tuscaloosa, Ala., population 95,000.Other subsequent but nonfatal derailments in Aliceville, Ala., Casselton, N.D., and Lynchburg, Va., followed a familiar pattern: huge fires and spills, large-scale evacuations and local officials furious that they hadn’t been told beforehand of such shipments. The U.S. Department of Transportation will issue new rules this month to govern the transportation of flammable liquids by rail. —The Federal Railroad Administration entrusts bridge inspections to the railroads and doesn’t keep data on their condition, unlike how its sister agency, the Federal Highway Administration, does so for road bridges. —Most states don’t employ dedicated railroad-bridge inspectors. Only California has begun developing a bridge-inspection program. — The U.S. Department of Transportation concluded that crude oil from North Dakota’s Bakken shale region posed an elevated risk in rail transport, so regulators required railroads to notify state officials of large shipments of Bakken crude. However, the requirement excluded other kinds of oil shipments by raid, including those from Canada, Texas, Wyoming, Colorado and Utah. —While railroads and refiners are reserving the newest, sturdiest tank cars available for Bakken trains, they, too, have ruptured in derailments, and Bakken and other kinds of oil are likely to be moving around the country in a mix of older and newer cars for several more years. © Curtis Tate/McClatchy DC/TNS BNSF crude oil trains pass each other in Galesburg, Ill.
U.S. railroads moved only 9,500 cars of crude oil in 2008 but more than 400,000 in 2013, according to industry figures. In the first seven months of 2014, trains carried 759,000 barrels a day on more than 200,000 cars — 8 percent of the country’s oil production, according to the federal Energy Information Administration. The energy boom, centered on North Dakota’s Bakken region, was made possible by hydraulic fracturing, or fracking, a horizontal drilling method that unlocks oil and gas trapped in rock formations. It was also made possible by the nation’s extensive rail system. Crude by rail has become profitable for some of the world’s richest men. Warren Buffett, the billionaire investor, bought BNSF Railway in 2009. It’s since become the nation’s leading hauler of crude oil in trains. Bill Gates, the Microsoft founder and philanthropist, is the largest shareholder in Canadian National, the only rail company that has a direct route from oil-rich western Canada to the refinery-rich Gulf Coast. Although the price of oil has fallen more than 50 percent since last January and rapidly in recent weeks, crude by rail shows few signs of slowing down. The six largest North American railroads reported hauling a record 38,775 carloads of petroleum in the second week of December. “We anticipate that crude by rail is going to stay over the long term,” said Kevin Birn, director at IHS Energy, an information and analysis firm and a co-author of a recent analysis of the trend. Regulatory agencies and the rail industry may not have anticipated the sudden increase in crude oil moving by rail. However, government and industry had long known that most of the tank cars pressed into crude oil service had poor safety records. And after 180 years in business, U.S. railroads knew that track defects were a leading cause of derailments. Railroads are taking corrective steps, including increased track inspections and reduced train speeds. They have endorsed stronger tank cars and funded more training for first responders. Ed Greenberg, a spokesman for the Association of American Railroads, the industry’s principal trade group, said railroads began a “top-to-bottom review” of their operations after the Quebec accident. But the industry continues to resist other changes, including calls for more transparency. The dominant Eastern railroads, Norfolk Southern and CSX, sued Maryland to stop the state from releasing information about crude-oil trains. The industry also seeks affirmation from the courts that only the federal government has the power to regulate railroads. The dominant Western carriers, BNSF and Union Pacific, joined by the Association of American Railroads, sued California over a state law that requires them to develop comprehensive oil spill-response plans. After a CSX crude oil train derailed in downtown Lynchburg, Va., last April 30, spilling 30,000 gallons of Bakken crude into the James River, the U.S. Department of Transportation issued an emergency order: Railroads carrying more than 1 million gallons of Bakken crude, or about 35 tank cars full, were required to begin notifying state emergency-response commissions where and how often such shipments move so communities could better prepare for accidents. Some states agreed, and the Transportation Department voiced no objections. Others, however, declined to sign the agreements, finding no reason to exempt the oil-train reports from their open-records laws. Full or partial Bakken train reports from 22 states show an estimated range of how many Bakken trains pass through each county each week, and the routes they use. Some states, such as Virginia and New York, released all the details. Illinois didn’t reveal the routes. Alabama and New Jersey disclosed only the counties the trains pass through, not the routes or frequency. Having lost the fight in California, Washington state and elsewhere, some railroads continued to press their case in other states that the reports were security and commercially sensitive. After the Pennsylvania Emergency Management Agency denied McClatchy’s request for reports in July, McClatchy appealed the decision to the state’s Office of Open Records. In October, the open records office ordered the emergency management agency to release the records. Soon thereafter, the agency posted them in full on its website. In July, the Maryland Department of the Environment was about to release the Bakken reports to McClatchy when two railroads, Norfolk Southern and CSX, sued the state to block the release. The Federal Railroad Administration all but put the issue to rest in October. In guidance published in the Federal Register, the agency said no federal law protected the Bakken train reports from public disclosure, and that the information they contained was neither security nor commercially sensitive. Delaware, West Virginia, Idaho and Tennessee, which denied requests for records outright, haven’t reconsidered since the federal guidance was issued. Texas has not decided on how much information, if any, to release. Greenberg, of the Association of American Railroads, said the industry remained concerned that publicly releasing the information “elevates security risks by making it easier for someone intent on causing harm.” The reports “should remain with local, state and federal emergency responders,” he added. The reports show concentrated streams of Bakken traffic from North Dakota to the Mid-Atlantic, Gulf Coast and Pacific Northwest regions. The reports do not, however, show smaller quantities of Bakken or any quantity of other kinds of crude oil shipped by rail. Individual railroads may be notifying emergency responders of such cargoes, but, at least for now, they aren’t required to do so. The Federal Railroad Administration has sought comment on whether the reporting threshold should be lower and include other types of crude oil. Thompson, the railroad administration spokesman, said the emergency order in May was meant to be “a powerful but narrowly constructed tool to address an imminent hazard,” the one presented by Bakken crude. “It was and remains an interim step in our ongoing effort to ensure the safe transport of crude by rail,” he said. In March, emergency-response officials in Sacramento, Calif., were stunned to learn that the decommissioned McClellan Air Force Base on the city’s northwest side had become a transfer point for crude oil. After a reporter told him about the facility, the city’s interim fire chief sent his battalion chief and a hazardous-materials inspector to the site, where they found 22 tank cars loaded with crude oil. The facility had been operating for several months, without the knowledge of local fire chiefs or the county emergency manager. It had also been operating without a permit from the Sacramento Metropolitan Air Quality Management District, apparently in violation of California’s environmental laws. The same week the Sacramento Bee published a story in late March revealing its existence, the facility received a permit to transfer 11 million gallons of crude oil a month from trains to trucks. In September, EarthJustice, a San Francisco-based environmental group, sued the air quality management district, challenging its decision to issue the permit without public comment or an environmental-impact review. In October, Sacramento County’s top air-quality official rescinded the permit, acknowledging that its approval was a mistake. The McClellan transfer operation closed down in mid-November. Two or three Bakken trains a month are moving through California’s capital to other destinations, and area officials are bracing for a big increase: The California Energy Commission projects that rail could deliver 22 percent of the state’s petroleum needs in a few years. In response to growing concern about emergency preparedness, the rail industry established a training program at its research and testing facility in Pueblo, Colo. Since classes began in July, the nation’s largest railroads have spent $5 million to train 1,500 emergency-response personnel at the school. Sen. Heidi Heitkamp, D-N.D., persuaded the Federal Emergency Management Agency to contribute another $5 million to continue the program. Individual railroads also bring training to many communities along their routes. CSX, for example, recently concluded an 18-city tour with its Safety Train, a mobile classroom that educates first responders on the basics of responding to rail accidents. The railroad said 2,200 responders from 350 departments participated. But the training may have its limits. The National Fire Protection Association estimated that in 2009, the most recent year for which statistics are available, there were about 1.1 million firefighters spread across 30,000 departments. More than 800,000 of them were volunteers. Nationwide, volunteer departments have turnover rates of 20 percent to 50 percent. Steve LoPresti, the hazardous-materials chief for Montgomery County Emergency Medical Services in suburban Philadelphia, said his department was all-volunteer. The department has a “robust” training schedule, he said, and has worked with other agencies and railroads hauling crude oil through the county. But it can be tough for volunteers to take the time off for training, even if someone pays for it. Lac-Megantic showed the enormous risk that even the best-trained firefighters might face. In Senate testimony last April, Tim Pellerin, a Maine fire chief whose department assisted its Quebec neighbor, said it had taken 1,000 firefighters from 80 departments on both sides of the U.S.-Canadian border 30 hours, a million gallons of water and 8,000 gallons of firefighting foam to bring the fire under control. Rick Edinger, assistant chief of the Chesterfield County, Va., Fire and EMS department and a hazardous-materials expert who testified on oil-train fires at the National Transportation Safety Board in April, said most departments were capable of responding to an incident involving a 9,000-gallon gasoline-tanker truck. But one rail car can hold as much as 30,000 gallons. A 100-car oil train could contain 3 million gallons. A common thread runs through the Lac-Megantic, Aliceville and Casselton derailments: the workhorse DOT-111 tank car. The NTSB has been warning about it for decades. The car is minimally reinforced and has a well-documented tendency to puncture or rupture in derailments. A series of explosions from the late 1960s to the late 1970s killed dozens of people, including railroad workers and first responders, prompting an overhaul of the pressurized tank cars then used to haul flammable and toxic gases with many of the same features now being discussed. The problems subsided by the early 1980s. But unlike those overhauled cars, the DOT-111 wasn’t similarly retrofitted. It continued to fail catastrophically in derailments that involved flammable or poisonous liquids, as three decades of NTSB accident reports show. Many of those accidents — including ones in Newark, N.J., in 1981m Dunsmuir, Calif., in 1991 and Baltimore in 2001 — were caused by track defects or human error. But in report after report, the NTSB warned that the design of the DOT-111 tank car increased the severity of these accidents. About a decade ago, railroads began transporting large volumes of ethanol, a renewable, highly flammable alternative fuel. Rail transportation of ethanol increased over several years, peaking at 360,000 carloads in 2011. At least seven fiery derailments from 2006 to 2012 involved ethanol transported in DOT-111 cars. In June 2009, a Canadian National train derailed on washed-out track at a road crossing at Cherry Valley, Ill. Multiple DOT-111 tank cars punctured, spilling more than 300,000 gallons of ethanol. A woman was killed when fire engulfed her vehicle at the crossing. The Association of American Railroads petitioned the Pipeline and Hazardous Materials Safety Administration in March 2011 for an improved tank-car design. About a year later, Deborah Hersman, the NTSB chairman at the time, wrote to Cynthia Quarterman, who was then the head of the Pipeline and Hazardous Materials Safety Administration, pleading for improvements to the DOT-111. In her reply, Quarterman concurred with Hersman but expressed concerns about the cost. Two months after Lac-Megantic went up in flames in July 2013, Quarterman’s agency released its Advance Notice of Proposed Rulemaking, the first step in a usually lengthy process. Last July, the Transportation Department proposed a 2017 deadline to phase out or retrofit the DOT-111 fleet. But for now, the car is ubiquitous in crude oil and ethanol trains nationwide. That wasn’t enough to satisfy environmental groups, which petitioned the Transportation Department for an immediate ban on DOT-111 cars hauling Bakken crude oil. When the department denied the petition, the groups sued. Railroads generally don’t own the tank cars used to transport oil by train. Since the more recent high-profile accidents, many refiners have chose to go with the higher standard the rail industry adopted voluntarily in 2011, with thicker shells and extra shielding on the ends of the cars and features that protect top and bottom valves in case of a derailment. BNSF and Canadian Pacific, two of the biggest Bakken haulers, have imposed surcharges on crude oil shippers who use pre-2011 tank cars. However, the oil and rail industry’s principal trade groups have requested that regulators give them more time to phase out the cars. Under both government and industry proposals, the cars with the fewest protections could remain in crude oil service through 2020. The $1.1 trillion spending bill Congress approved in December includes a requirement that the DOT issue its final rule by Jan. 15. Even the newer cars have vulnerabilities. Post-2011 cars involved in a derailment last January in New Augusta, Miss., spilled 50,000 gallons of heavy Canadian crude. So did at least one newer car in Lynchburg, which released its entire contents of Bakken crude into the James River, most of which burned. Some of the most vocal advocates for a faster retrofitting or retirement of the DOT-111 tank cars are elected leaders in cities and towns. Karen Darch, the village president of Barrington, Ill., a Chicago suburb, has testified on Capitol Hill and submitted comments to regulators. Two busy rail lines intersect in her community, and trains carrying crude oil and ethanol pass very close to homes, businesses and schools. In Tuscaloosa, repairs have begun on the century-old bridge. But its condition had received less attention from local, state and federal authorities, and the railroad that maintains it, before crude oil trains began rolling over its rotting timbers in 2013. The local industrial development authority gave $785,000 in tax abatements to the Hunt Refining Co. of Houston to build a two-track rail terminal capable of unloading 600,000 gallons of crude oil a day at its Tuscaloosa refinery. Mike Smith, a lawyer for the agency, said its jurisdiction didn’t extend beyond the refinery and that it had no authority to evaluate the condition of, or require repairs to, the rail infrastructure that leads to it. A spokeswoman for Hunt Refining declined to comment. The Alabama Department of Environmental Management quickly approved Hunt’s permits to build and operate the terminal, with no public comment or review. A spokesman for the department didn’t return phone calls seeking comment. The Federal Railroad Administration doesn’t inspect bridges. Railroads have that responsibility. The Alabama Southern Railroad, which is owned by Watco, a company headquartered in Pittsburg, Kan., maintains the Tuscaloosa bridge and the track that runs across it. Regulators have cited the company many times over the years for safety violations. Federal Railroad Administration inspection reports obtained through a Freedom of Information Act request show that inspectors recommended penalties for Alabama Southern 15 times from January 2006 to September 2013. In June, an Alabama Southern train carrying crude oil derailed in Buhl, Ala., about 12 miles west of Tuscaloosa. Though nothing spilled, seven battered tank cars remained on the ground for the next two months, a short distance from people’s front porches. Tracie VanBecelaere, a Watco spokeswoman, said the company would spend as much as $17 million over three years in new rail, ties and ballast on the 62-mile Alabama Southern line between Tuscaloosa and Columbus, Miss. In late October, bundles of new crossties lined the track near a road crossing in Northport, across the river from Tuscaloosa. Tie replacements “will continue for several months,” VanBecelaere said. She said the track was inspected more thoroughly than federal law required and was checked ultrasonically for internal defects twice a year. The old bridge is getting a $2.5 million overhaul as part of the same project, VanBecelaere said. She said it had passed an inspection over the summer. John Wathen, an environmentalist who monitored the condition of the rail infrastructure around Tuscaloosa for the past year, wonders whether it’s enough. “The repairs I see them making right now are more like putting a Band-Aid on a gaping wound,” he said. October is a busy time in Tuscaloosa, with Alabama football season in full swing. One home-game weekend this past season, , there were no hotel rooms available within 50 miles of the city. Tuscaloosa’s population expands on home-game days. The university’s Bryant-Denny Stadium can hold more than 100,000 people. The railroad bridge is perhaps more than a mile from the stadium, as the crow flies. Across the river in Northport, a camp of recreational vehicles owned by football fans is just 50 feet from the bridge. The city council allows the tailgaters to park their campers there for the entire season. The 7,500-seat Tuscaloosa Amphitheater is near the bridge on the opposite bank. The Oliver Lock and Dam, a popular fishing spot, is about half a mile downriver. Thousands more people descend on Northport in October for the annual Kentuck Festival of the Arts. Most Tuscaloosa residents know about the bridge and some have stories about how it intersects with their lives. But few know about the hazardous cargo that creeps across it in slow-moving trains, with them the potential for disaster. And Tuscaloosa knows disaster. On April 27, 2011, a powerful tornado, with winds of 190 mph, ripped through the city, chewing up neighborhoods, schools and shopping centers. Of the 65 Alabamians killed by the tornado that day, 52 were in Tuscaloosa. Wathen worries that if an oil train derailed on or near the bridge, it wouldn’t take long for the spilled cargo to reach the Black Warrior River. Once it reached the dam, Wathen said, it would be virtually impossible to clean up, no matter what kind of oil it was. “It would be an environmental catastrophe,” he said. Wathen has other fears. In addition to the 47 fatalities, the derailment and fire in Lac-Megantic destroyed 50 buildings, consuming the heart of the city’s business district.